Emotional Referral Zone 3 - Piedmont Physical Medicine & Rehabilitation, P.A. The third ERZ furthers the development of self-esteem and personality. The insecurities that arise from a lack of self-esteem generate the inability to draw and maintain strong boundaries and develop a personal code of honor. Without self-esteem we lack the courage to follow our choices and become enslaved to our own fears. The third ERZ is where you define your sense of integrity, dignity and your personal code of honor. It is here that your honor code is formed. The more fully your third ERZ values are developed, the more positively they will be expressed by your fifth ERZ choices. Revolution: Separate from group thought and establish your own sense of authority. Involution: Discover what you believe, think and feel about yourself. Narcissism: Create a new image of oneself. Take ownership in your problems and empower the strengths you have. Evolution: Maintain your principles, dignity, and faith. Be mature and honorable in the relationship you have with yourself and accept responsibility for the person you have become. The energies that come together in this zone have one goal: to help us mature in our self-understanding the relationship we have with ourselves, and how we stand on our own and take care of ourselves. 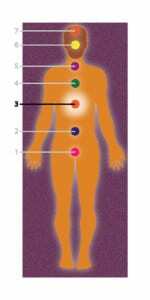 Abdomen, stomach, upper intestines, liver, gallbladder, kidney, pancreas, adrenal glands, spleen, middle spine behind the solar plexus. Arthritis, gastric or duodenal ulcers, colon/intestinal problems, pancreatitis/diabetes, chronic or acute indigestion, anorexia, bulimia, liver dysfunction, hepatitis, adrenal dysfunction. Trust, fear, intimidation, self-esteem, self-confidence, self-respect, ambition, courage, ability to handle crisis, care of yourself and others, sensitivity to criticism, personal honor, fear of rejection and looking foolish, physical appearance anxieties, strength of character. What don’t you like and why? Do you blame others as a way of protecting yourself? Are you able to admit when you are wrong? Are you open to feedback from other people about yourself? Do you need the approval of others? If so, why? Do you consider yourself strong or weak? Are you afraid of taking care of yourself? Have you been in a relationship with a person you didn’t really love, but it seemed better than being alone? Can you decide to make changes in your life and then stick to your commitment? Are you afraid of responsibility, or, do you feel responsible for everything and everyone? Are you continually wishing your life were different? If so, are you doing anything to change it, or have you resigned yourself to the situation?